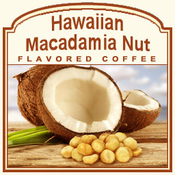 Hawaiian Macadamia Nut flavored coffee is the sweetest fusion of Hawaiian flavors. Buttery and bold from the macadamia nuts, this Hawaiian Macadamia Nut coffee features 100% Arabica beans and a full body of flavor. With only 2 calories in each cup, you can experience the toasted coconut flavors of the Hawaiian Islands with a blast of buttery goodness. A heat-sealed valve bag will ensure the freshest coffee possible. Roasted and shipped on the same day, Hawaiian Macadamia Nut flavored coffee will arrive fresh and decadent. If you like delicious buttery flavors with nutty undertones, look no further than this incredible flavored coffee.